My book this week is a free book from Maggie Shayne. I just read and loved her Brown and De Luca series and when a book from the Texas Brand series was free on Amazon I could not resist. It has the danger that the Brown and De Luca series has but it is not quite as intense. 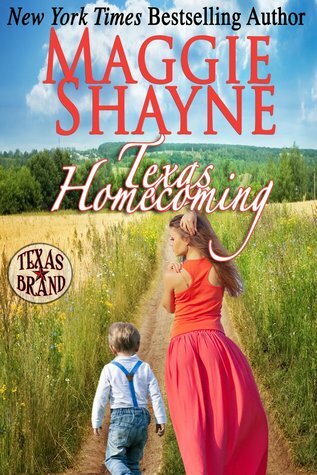 Here is the beginning of Texas Homecoming by Maggie Shayne. "Luke stood at the graveside of his best friend and mentor, the man he'd always wanted to emulate, and waited for the others to arrive - but they never did." I love the Smythe-Smith series and The Sum of All Kisses is the best so far. We met Sarah in one of the first books when she refused to show up for the annual Smythe-Smith musical and Hugh there was talk about the duel between he and Daniel. Now they have their own story. Both are really great characters and they are very well developed. Sarah is very vocal and Hugh is very withdrawn but when they get together sparks fly. Both think that the other is a terrible person but once they are forced together the type of sparks change. Theirs is a great journey to a HEA. Pick this one up for a great afternoon of reading. Avon published The Sum of all Kisses by Julia Quinn in 2013. "Obviously," Jones said, finally looking up from his papers, "we're now dealing with something a little bigger than grave robbery. The question is: What?" 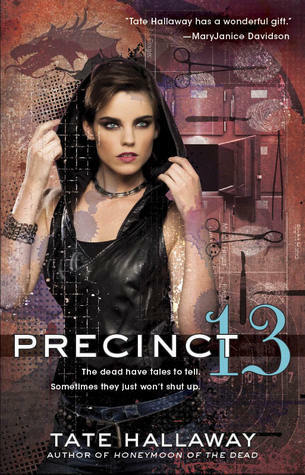 Precinct 13 is set in Pierre, South Dakota. Not you normal setting for a paranormal mystery. So far it is a fun read with a lot of room for surprises and future stories. I am not musing today. Instead I decided to post a list of the books I have on pre-order from Amazon. Are any of them on your wish or pre-order list. Hardened rancher Ridge Bowman has long told himself he has no need for love; just work and his little girl are enough to get him through. But when his cleaning lady, Sarah Whitmore, gets injured on his staircase, well, of course he has to invite her to spend the holidays with him. It’s only the responsible thing to do. Only, Sarah isn’t really there to work on his house. She came bearing precious artwork belonging to Ridge’s late mother, and possibly a secret that could devastate them both. But as Christmas draws closer, so does Ridge and Sarah convinces herself that she will tell him what she knows as soon as the holiday is over. She might be the key to his past if only he could be a part of her future. I just can’t get enough of the Christmas Romances that appear this time of year. A Cold Creek Christmas Surprise is the last book in a series about the Bowman family and the first I have read in the series. It does a great job of standing alone. There is a murder and theft at the heart of Bowman family stories. All four of the children want to know who robbed and killed their parents years ago. Sarah Whitmore finds part of that answer in a storage unit that belonged to her father. The story unwinds from there. I loved Sarah. She was strong and knew what was right and what was wrong. She and Ridge Bowman are made for each other but the crime stands between them. This is a sweet romance with a great journey to the HEA. If you love Christmas Romances you do not want to miss this one. It is a well written and well plotted story that might be one of your favorites as it is one of mine. Harlequin released A Cold CreekChristmas Surprise by RaeAnne Thayne in 2013. I received an ARC of A Cold Creek Christmas Surprise from NetGalley. 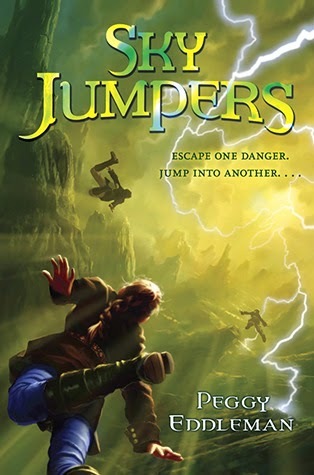 My Book Beginning this week is from Sky Jumpers by Peggy Eddleman. Sky Jumpers is a book for young readers and I received copy from Amazon Vine. "You would think I's never jumped off a cliff before, based on how long I stood there. Not jumping." To put an end to the conflict, Dragos, Lord of the Wyr, sends them on a reconnaissance mission to the Elven land of Numenlaur. Forced to work together, Aryal and Quentin’s mutual antagonism escalates. Each fight draws forth more passion—culminating in an explosively sexual confrontation. But when their quest reveals real danger, Aryal and Quentin must resolve their differences in ways beyond the physical, before the entire Wyr is threatened." I loved Kinked. The two main characters are great. Sentinel Aryal, a harpy, and Quentin Caeravorn, a new Sentinel, really make sparks when they are together. Their dialog is full of great lines that fit and keep the story on track. Their actions keep the plot moving. Thea Harrison has put the two in a situation that fits the two personalities to a tee. Drago, Pia and others do make appearances in the story but the main action is between Aryal and Quentin. Sometimes as a series progresses the stories get a little stale. That does not happen with Kinked. If anything it adds to the strength of the series. Most of the world building was done in previous book. While Kinked can stand-alone but it is best if you read the series from the beginning. 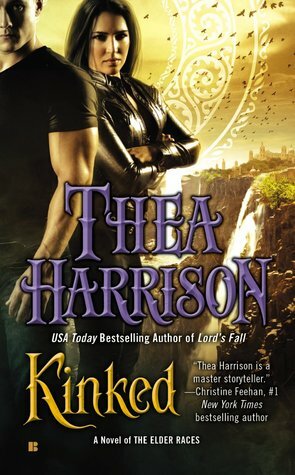 Berkley Sensations published Kinked by Thea Harrison in 2013. Esther Diamond's year gets off to a rocky start when NYPD's Detective Connor Lopez, who slept with her and then didn't call, shuts down her current place of employment and gets her arrested. Once she's out of handcuffs, and with no paying work on the frigid horizon, Esther takes a small role in a grad student's film project in Chinatown—where her friend semi-retired hit man Lucky Battistuzzi, who escaped Lopez's sweep at the Little Italy restaurant where Esther works between acting jobs, is hiding out in a Chinese-Italian mortuary. Esther and Lucky soon realize that something strange is going on in Chinatown, where beautifully handcrafted fortune cookies are inflicting deadly mystical curses on the hapless victims who receive them as gifts—and before long, Esther learns that Detective Lopez is one of the recipients. As preparations for Chinese New Year heat up in the ice-covered neighborhood, when the streets will be filled with costumed lion dancers, firecrackers, and dense crowds, Esther and Lucky summon the help of their friend Max, a semi-immortal mage and semi-solvent bookseller, to help them save Chinatown and Lopez (with whom Esther is not on speaking terms) from a mystical murderer of maniacal menace. OK, this is book # 6 for Esther and Conner and they still are not together. Book 5 finished with it looking like they were finally getting together and then Conner failed to call as promised. That failure is the basis for much of the interaction between the two in The Misfortune Cookie. There was not as much of the paranormal is this book. Someone is putting a death curse in fancy fortune cookies. That is almost a side story to what is going on between Esther and Connor. Esther is really unforgiving and poor Connor is really clueless. As angry as I was with him at the end of book 5 I started to feel sorry for him in book 6. The cursed fortune cookies do play a big part in the end. Esther does not have a paranormal bone in her body but does believe in the paranormal powers. Connor does not believe in anything like the paranormal but does have paranormal powers that appear when he is under stress. When Connor gets a cursed fortune cookie and Esther saves him for the curse it causes problems between the two so look to see what will happen in book 7. I will have it on pre-order just like I had The Misfortune Cookie. The story is set in Chinatown in New York and there is a lot of the history of Chinese in America and Chinatown worked into the story. At time it is like a history text. Laura did a lot of research for the book and wants to share what she learned. 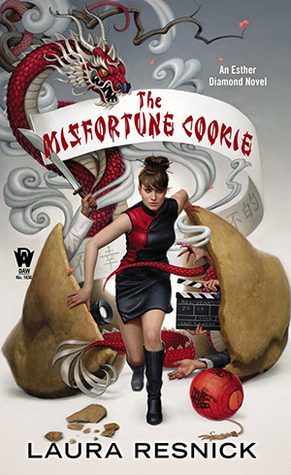 The Misfortune Cookie is not as fast paced as previous books but it is a good addition to the Esther Diamond series. This is a fun series that should be read in order. If you start with The Misfortune Cookie some back-story is worked in but starting from the beginning is much better. Daw published The Misfortune Cookie by Laura Resnick in 2013. My Teaser is from a book I received from Amazon Vine. 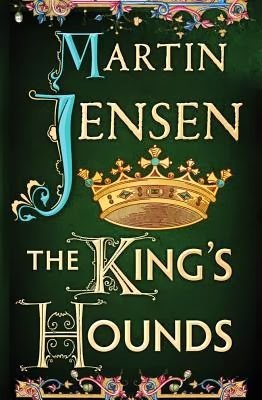 The King's Hounds by Martin Jensen is the first in a mystery series set in 1018 and deals with an era I knew little about. Martin Jensen is a Danish novelist and this book is the first to be translated into English. Cnut the Great (Old Norse: Knútr inn ríki; c. 985 or 995 – 12 November 1035), more commonly known as Canute, was a king of Denmark, England, Norway, and parts of Sweden, together often referred to as the Anglo-Scandinavian or North Sea Empire. After the death of his heirs within a decade of his own and the Norman conquest of England in 1066, his legacy was largely lost to history. Historian Norman Cantor has made the statement that he was "the most effective king in Anglo-Saxon history", despite his not being Anglo-Saxon. What is the Sci-Fi Romance Quarterly? The Sci-Fi Romance Quarterly is an online magazine devoted to science fiction romance. Each issue includes news, reviews, opinion columns, and an original, exclusive short story–all for free! Discover the latest book releases and get the inside scoop on which stories are right for you. Think of it as a one-stop trip for all your sci-fi romance needs. What is science fiction romance? In a nutshell, it’s a romance that takes place in a technological setting and has an upbeat ending. Some stories have more science fictional elements and some have less, but generally the stories focus on the intersection of technology and romance. Read the Editorial from Issue 1 to get an idea of what it means to Editor, Kaz Augustin. In the sixth book of the Guild Hunter series we are back with Elena (Guild Hunter and newly made angel) and Raphael (the Archangel who made her). They are under attack and must work against overwhelming odds. In Archangel’s Legion we get a closer look at the marriage between Elena and Raphael. Both are such strong characters and that strength brings some conflict between the two. Elena has to accept that Raphael does not show others the side he shows her. She has to make sure he understands her commitment to human’s she has know for years. Characters from previous books are part of the story but the focus is on Elena and Raphael. The book is filled with tension. There is a war coming and they are outnumbered. They are being weakened by disease and other attacks. Elena is still coping with problems with her family and the new knowledge that is revealed about other hunters in her past. All of this combines to make an exciting story. 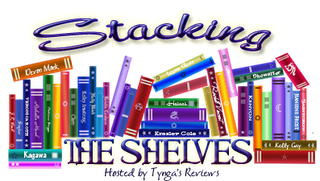 Look for some surprises when the battle finally starts and for enough loose ends to set up the next book due out in 2014. Archangel’s Legion keeps the Guild Hunter series as exciting as ever and sets the stage for the next book. 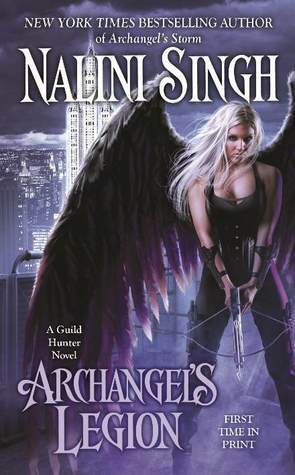 Jove published Archangel’s Legion by Nalini Singh in 2013. All my book this week are eBooks so no covers. 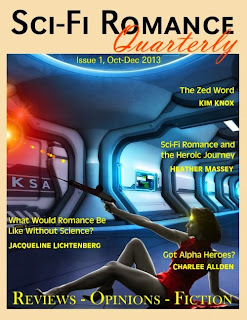 SciFi Romance Quarterly is now online and free. Follow this link to get your free copy. 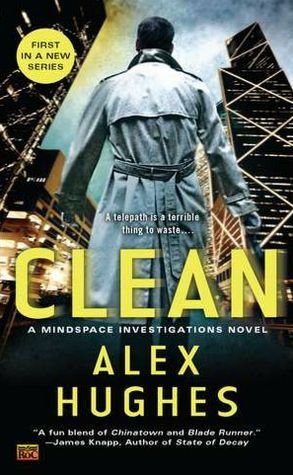 My Book Beginning this week is from Clean by Alex Hughes. This is a book I read over a year ago and just looked up on my book shelves. It is the first in a series really like. The author is going to be a Coastal Magic in February and I hope to go. I am waiting to hear how long the recovery from surgery on a torn meniscus will be before I sign up. Here is the beginning. "My first interview of the night was Esperanze Mensalez-Mar, a thirty-something woman dress in a pink-pressed suit I suspected cost more than my last paycheck. Not that I'd seen the paycheck, but that was the kin of impression she gave off, like she had too much money to copy. She was here as a suspect in the death of her husband." "I used to work for the Telepath’s Guild before they kicked me out for a drug habit that wasn’t entirely my fault. Now I work for the cops, helping Homicide Detective Isabella Cherabino put killers behind bars. My ability to get inside the twisted minds of suspects makes me the best interrogator in the department. But the normals keep me on a short leash. When the Tech Wars ripped the world apart, the Guild stepped up to save it. But they had to get scary to do it—real scary. Now the cops don’t trust the telepaths, the Guild doesn’t trust me, a serial killer is stalking the city—and I’m aching for a fix. But I need to solve this case. Fast. I’ve just had a vision of the future: I’m the next to die." Original trade paperback, sequel to Darkship Renegades and Darkship Thieves. The son of a ruler on Earth instigates civil war and revolution when he attempts to take the place of his assassinated father and uncovers a terrible secret that has been used to enslave humanity. But when Luce Keeva attempts to take hold of the reins of power, he finds that not all is as it seems, that a plot for his own imminent murder is afoot and that a worldwide conflagration looms. It is a war of revolution, and a shadowy group known as the Sons of Liberty may prove to be Luces only ally in a fight to throw off an evil from the past that has enslaved humanity for generations." While this says it is a sequel to Darkship Renegades and Darkship Thieves the action does not happen after the first two books, Most of the action is happening at the same time but on Earth instead of in space. There are several places where the characters and action from both are together but the author assumes you have read Darkship Thieves and does not repeat what happened in the other book. As a result you could be very confused. Luce Keeva tells A Few Good Men in the first person. He has been in prison for 14 years and escapes where there is a prison break. He goes home to find all of his family dead. When he tries to take his Father’s place some long held secrets are revealed. As a result he joins in with others to bring about change. His story is the story of the revolution that follows. Because it is what one man remembers there are large sections of the book that just present information and there is action only where Luce is present. Books where you spend a large amount of time in a characters head are not my favorites. I prefer getting information through dialog and action and there was just not enough of that in A Few Good Men to satisfy me. As a result it took me a long time to read the book. I would read a little and then put it down, as it just was not holding my attention. I did finish because I had read the first two books and kept going back to see if it wouldn’t get better. This would stand along but there are sections where the actions from the other books intersect. Where that happens some things just would not make sense if you only read this one book. I am glad I finished the book but it is far from one of my favorites. 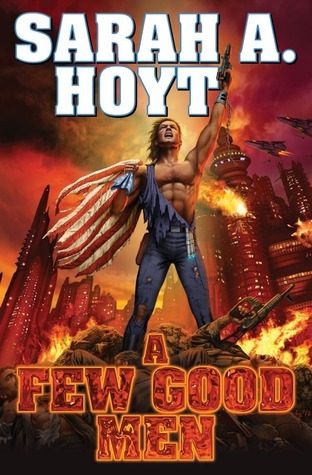 Baen published A Few Good Men by Sarah A. Hoyt in 2013. 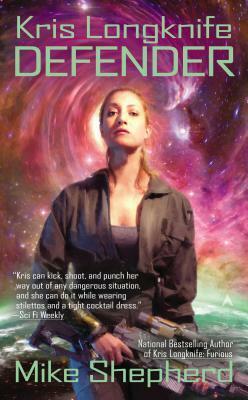 "Kris Longknife is back in the good graces of the brass—and to demonstrate that, they've promoted her to Admiral. Now her mission is to find the home base of the space pirates who are plaguing the fringes of the galaxy. But no mission is ever simple when your name is Longknife. And this time the complications range from the military to the personal, as Kris finds herself—reluctantly—having to make some command decisions about her future." This is book #11 in the series and again Kris is facing a lot of danger. All of the usual characters are back and the adventure is never ending. The big difference is that there is romance in the air. Kris is at the other side of the galaxy and her great grandmother takes a hand in getting Kris and Jack some time alone. It is about time. The entire book is a lead up to a big battle and I though that Mike Shepherd was going to leave us hanging. Instead he surprised me. Just as I though there were not enough pages left to for the two forces to meet he fought a quick and swift space battle that solved one problem but left more to come. Kris Longknife: Defender is a good addition to the series. It can be read as a stand-along but read them all. You will be in for a great adventure if you do. 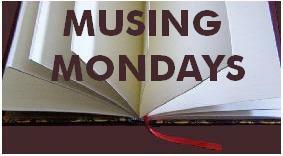 If you read my Musing Monday post you saw where I found the Dauntless with Jack Campbell as the Captain. Is this a game authors play? Maybe putting another Science Fiction author and his book title in the middle of a book is a way to see if anyone notices. ACE published Kris Longknife: Defender by Mike Shepherd in 2013. My teaser today if from The Misfortune Cookie (Esther Diamond #6) by Laura Resnick. This is one of the books I got from Amazon last week and I haven't started it yet so the teaser is for all of us. "Do you need any ...Oh, right. Never mind." The cop grinned again. "I just love a happy ending." He was chuckling as he turned and went back the way he had come." Captain of the Dauntless. That really caught my attention. Why? Because Jack Campbell has his own Space Opera series and the first book is Dauntless. I don't think that this was just an accident; another author's name and the title of the first book in his series. I think this is something planned. It makes me wonder if somewhere in Jack Campbell's books there may be a space ship named for a book in the Kris Longknife's series with a Captain named Mike Shepherd. If you have seen any of the same let everyone know in the comments section.